The Frozen Continent is one of the unique Renaissance Christmas event dungeons that players can challenge each December. By hunting the overworld/dungeons for Christmas monsters players can find special scrolls that allow access to these dungeons. In this dungeon players are tasked with defeating the dark elf vanguard army and defeating the guardians of the fortress entrance. Players join the battle as the few remaining good polar bears are fighting in vain against polar bears under the influence of dark magic. 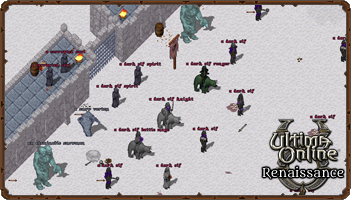 Players can even find and rescue a few polar bears willing to allow players to ride them into battle. Once enough of the Dark Elf army is defeated the Dark Spirits will awaken to find out who is attacking the fortress. Once the Dark Spirits are defeated the scroll owner will be given a key to the army camps loot which could have one or more of the following.